NHS trusts across Lincolnshire have been affected by a nation-wide cyber attack on NHS services and other organisations. Computers are down across the county’s hospital network due to the attack, which is understood to be sweeping a range of services and groups across the country. Screenshot of messages appearing for NHS workers. ULHT confirmed that the trust was among those impacted and all computers and phone lines have been shut down. It’s understood other county NHS trusts are also impacted. All hospitals in the county have been impacted and the trust says some emergency cases are being referred to other hospitals. Outpatient, endoscopy, cardiology and radiology appointments scheduled for this weekend have been cancelled. It is unclear whether GP services in the county have also been affected at the time of writing. Workers have described computer popups requesting money in the form of bitcoins. Mark Brassington, chief operating officer at ULHT said: “We can confirm that ULHT has been affected by the cyber attack that has hit a number of trusts across the country. “Lincoln County Hospital, Pilgrim Hospital and Grantham Hospital are all affected. “At the moment all IT systems and many phone lines within our hospitals are switched off. Departments are taking action to ensure patient care is prioritised. “We will be diverting some emergency cases to local hospitals which are not affected by the attack, where possible. “We ask patients to only come to our A&Es if absolutely necessary. “We do not yet know how long this incident will last, and therefore are cancelling all outpatient, endoscopy, cardiology and radiology appointments scheduled for this weekend. 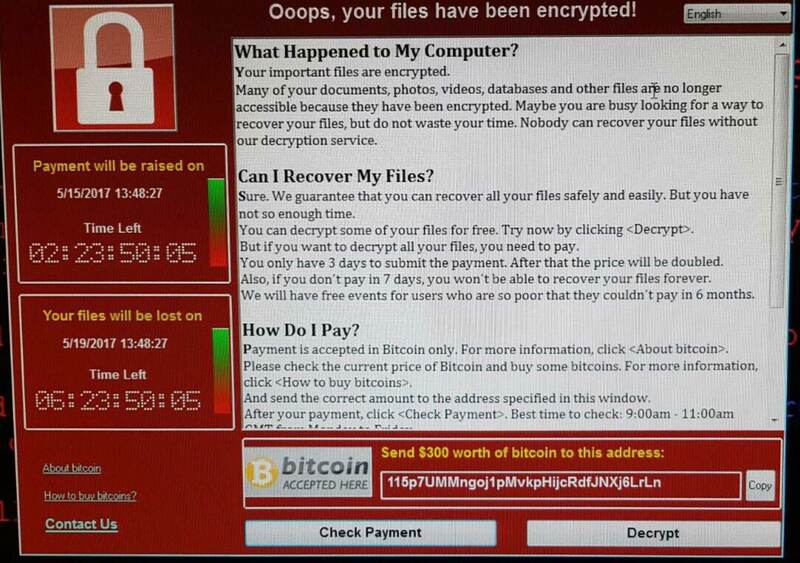 “An NHS Digital statement has been released in response to the attack: “A number of different NHS organisations have reported to NHS Digital that they have been affected by a ransomware attack. “The investigation is at an early stage but we believe the malware variant is Wanna Decrypter. “At this stage we do not have any evidence that patient data has been accessed. We will continue to work with affected organisations to confirm this. “NHS Digital is working closely with the national Cyber Security Centre, the Department of Health and NHS England to support affected organisations and to recommend appropriate mitigations.